When it comes to carbs, my absolute favourite of the lot is rice and rice noodles. You see I grew up on the stuff. As my mother was born in China, rice with just about everything was pretty standard at my family home. As a result I love all manner of rice noodle dishes: pad see ew, pad Thai, phat si io, Singapore noodles… But most of all, I love my mother’s cold Chinese summer noodle dish that she brought to Australia with her from China when she emigrated in 1958. These particular cold noodles are known in my family as “tsai-lo-perh”. 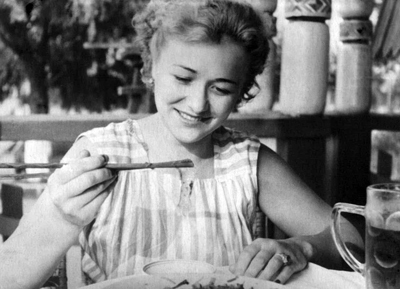 The White Russians who lived in Harbin, a Russian settlement in north China for four decades, used to flock to local Chinese restaurants to order their favourites of which one was this dish. I asked my mother what the name meant, she said the first word “tsai” means salad or greens. The rest she said she doesn’t know, only that when the words were spoken to the Chinese waiters, they were assured the dish would appear. Essentially this dish is nothing more than rice noodles, chopped salad vegetables a tiny bit of meat dressed with garlic and soy. But there is something amazing in its simplicity as once the flavours meld and come together there is only one way to describe it: simply delicious. As I was growing up this salad was on the kitchen table almost daily during late spring and summer. To appease my childish tastes my mother would make it especially for me with ordinary spaghetti though I went on to eat it only with rice noodles as I got older. There was always a massive bowl of it at family gatherings and parties, a bowl so big you would wonder how anybody was ever going to get through it but somehow everyone did. Others tried to copy but never came close. Maybe it’s the love that my mother always brings to her cooking that makes hers particularly good, I’m pretty sure that’s it. I do however think however that my version comes a good close second, and I’m sure that yours will too. Makes one large salad bowl to serve 4-6. Prep time thirty minutes, cooking time 15 mins. 1. Soak the noodles in a large bowl of warm filtered water for approximately 15 minutes until they are soft. Drain and set aside. 2. Cook the thinly sliced steak in a fry pan (I always use a cast iron skillet) to your liking and set aside. 3. Combine all the salad vegetables in a large bowl with the drained noodles. Pluck all the leaves off the bunch of coriander, add these to the salad then very finely slice the stems and toss these into the bowl as well. 4. Whisk all the dressing ingredients together and pour over the salad. Using your hands toss all the noodles and vegetables together to combine thoroughly. It won’t seem like a lot of dressing, however as the salad sits, the vegetables will release juices adding to the dressing. I always let the salad sit for at least 15-20 minutes in the fridge before serving. It just gets better with time! You can also add chopped wombok (napa cabbage) however I do find it tends to make the salad a little watery unless you eat it straight away. Delicious also with some toasted sesame seeds tossed over the salad before serving. For a Paleo version use kelp noodles. This shot was fun to put together because the salad is so beautiful and colourful. The background is a piece of distressed masonite pulled out of the trash that has the most beautiful texture. The Asian ceramic bowl was also found in the trash in a local hard rubbish collection (I’m baffled as to how anyone could throw it out). The plate is an under-plate from a pot plant, the bowl is from Mud Australia and the linen is by Iveta Sarta. The only light used in this image is window light and it was shot on a Canon 5D Mark 3. I’ve eaten a noodle salad very much like this, in Dalian, in NE China. There was no beef and the dressing included wasabi, a hold-over from the days of Japanese occupation. Beautiful photo. This looks great. The way you style your food always makes me want to eat it (even when it’s things I can’t have!). Just thinking of substitutions for the capsicum – how does thinly sliced snow peas and quartered cherry tomatoes sound? 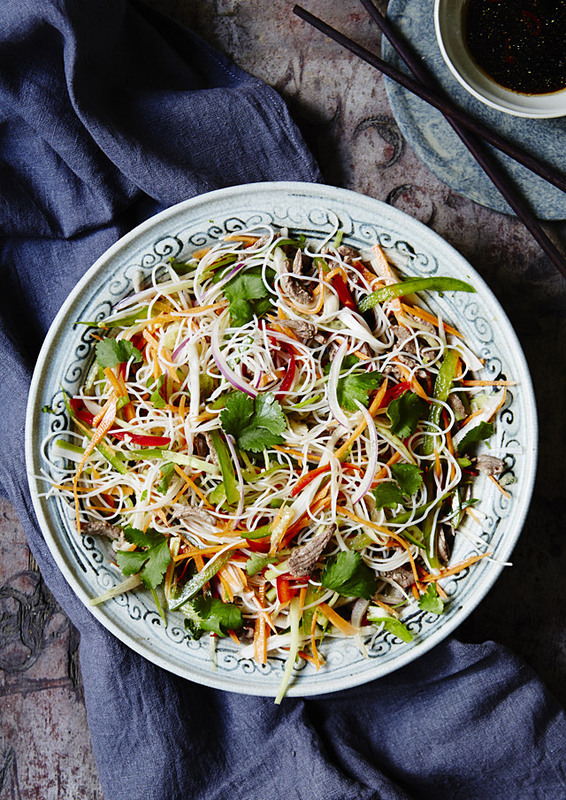 I love the cold noodle salad. Specially love the pic of your mother with the noodle and the beer. She looks so beautiful! Photo looks great. Recipe is fantastic. I need to try it. What a gorgeous looking salad! Exactly what i was looking for. I need a healthy salad following the holidays! Pinned! I really loved this recipe and all the history- I never knew about Russians living in part of China. And of course, I am a sucker for old family pictures, too! Your mother is a beautiful woman. I will have to try this recipe soon!